It’s hard to believe CORBA turns 24 this August. As another year goes into the record books, it is natural to reflect on what has been achieved—and what still needs to be done. For the most part there is a status quo regarding mountain bike access opportunities. However, we continue see efforts to block that access, and even decrease it. For example, in the City of Los Angeles, the Parks and Recreation department’s policy forbids bicycle riding on any unpaved path or trail despite a very large constituency of cyclists wanting to ride off-pavement living within the City’s borders. 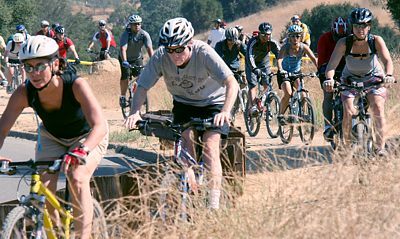 Having the Parks and Rec department as an opponent is bad enough, but there are also members of the public who are staunch opponents to bicycles on unpaved City paths and trails, many of whom are equestrians who continue to argue that bicycles and horses can not mix, despite examples to the contrary all across the country and even in the local mountains, including the Santa Monicas. Much like the trails themselves, advocacy is in constant transition. With CORBA it is no different. We have seen both additions and contractions to CORBA’s Board of Directors—long-time trail work volunteer and advocate Steve Messer joined the board earlier in the year, and his energy and computer skills have become immediate beneficial. Board of Director and Trail Crew Coordinator Hans Keifer has moved on due to increased job requirements (see story below). Thankfully Hans will serve as an advisor (and since he and Steve ride together on a regular basis, he’s sure to be hearing info first hand). If you use trails in the Angeles National Forest, Santa Monica Mountains National Recreation Area (SMMNRA), or Conejo Open Space Conservation Agency, you are indebted to Hans for all the work he has done on behalf of all trail users. Looking ahead, we are extremely excited about the trail evaluation and conversion process taking place in the SMMNRA. As directed by Sacramento, our district is considering several trails for conversion from restricted to shared use. CORBA has already had preliminary meetings with district and sector superintendents and will be reporting on the findings of the process in the next few months. So where are we now? Ironically, after 24 years, still very much the same as back in 1987. CORBA is in a very good position because of its relationships with local land managers to potentially realize some significant access gains within the next year. However, we are still in dire need of more members and more awareness in general of responsible riding practices, lest we become relegated off the trails because of potentially dangerous behavior. So we still have a way to go. 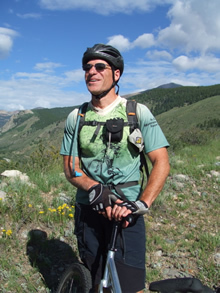 CORBA Board of Directors member and Trail Crew Coordinator Hans Keifer steps down from his leadership positions on January 1, but his involvement with CORBA will not likely fade from memory any time soon, or ever for that matter. Whether it was his tireless work coordinating and leading trail work days on hundreds of miles of trails in the Angeles National Forest and Santa Monica Mountains National Recreation Area, or his calm and steady presence at board and public meetings, Hans has always remained focused on helping mountain bikers enjoy the open space trails by keeping them open and getting more miles dedicated to shared use. In addition to his advocacy work during his seven years on the CORBA board... See the blog article on Hans' accomplishments for the rest of this story. CORBA’s Board of Directors recently voted to apply to the International Mountain Bicycling Association’s (IMBA) Chapter and Grass Roots Program. Initiated a little over a year ago, the program aims to help local clubs improve their grass roots efforts and community outreach by offering assistance with administrative duties that often drain a club’s energies better suited for advocacy. The program also offers clubs IMBA’s added resources and visibility. As an IMBA Founding Club in 1988, CORBA sees this program as coming full circle... See our blog article on IMBA chapters to get the rest of the story. 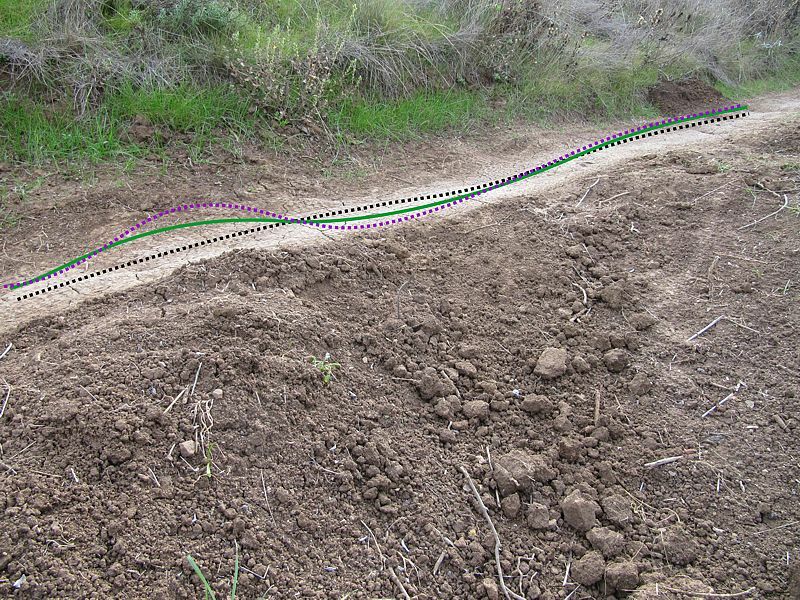 The black line shows the contour of trail. 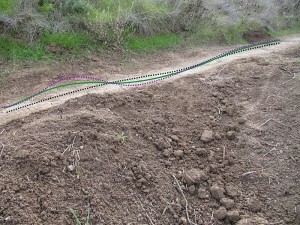 The green line shows the contour of an ideal rolling dip. The purple line shows how we try to construct them. Click the image to view a larger one. Many or most of the drainage dips that volunteers constructed during trailwork on the Wood Canyon Vista (Backbone) Trail in Point Mugu State Park last month have been vandalized, de-constructed, and otherwise left ineffective. Downhill ramps were dragged into the uphill dip, greatly reducing their ability to prevent rainwater carving ruts down the middle of the trail. Hopefully this season’s storms will not be so intense that the drainage dips are overwhelmed. Extensive rain rutting will likely require the State Parks to run a Sweco bulldozer up the trail, as they did this spring, which will result in a loose, unstable trail surface that angered so many people at the time. Most trails in our local riding area don’t respond well to rain. They have a high content of clay that turns into sticky, slippery muck that binds to everything it touches. 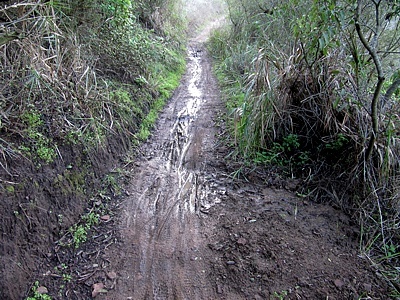 Most wet trails don’t respond well to bikers, hikers or equestrians until they’ve had time to dry out. Hikers and horses make holes and ridges in the trail that become as hard as concrete when the trail dries. Bikes make grooves down the middle. These grooves collect water when it rains again, turning first into little channels to move the water downhill, then into little ruts, then large ruts that destroy the trail. You’ve heard about the beat of a butterfly wing that causes a hurricane? Then remember the tire track that turns a tail into one large rut! There is no trailwork scheduled for 2011 yet. Check back to our Trailwork web page for updates. Support Rails to Trails. Petition closes at midnight December 8th. Saturday January 1st is the next skills clinic.